I’ve had a few questions on some of the images I’ve posted recently (like – how’d you do that?!) and thought it a good time to speak a few on newborn safety. 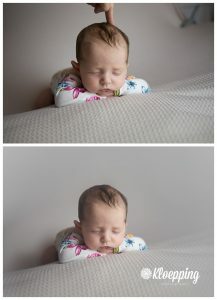 You’ve seen me post a few times about SIB – our StandInBaby that share custody with Fluttering Shutter Photography. One of the primary goals of SIB is to enable photographers to learn new poses safely. Here you see SIBrina below with Miss Ashley – twinning! 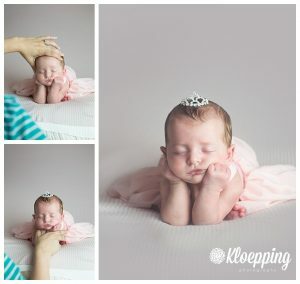 Head in hands (or froggie as some call it) is a popular pose for newborn photographers add to into their posing flows. Parents love it and it’s super adorable. The thing is, this pose is not a single image. To execute it safely you need an extra set of hands. In Ashley’s case I had her momma, an experienced newborn photographer, to help me out. When I don’t have that luxury I usually employ mom or dad. 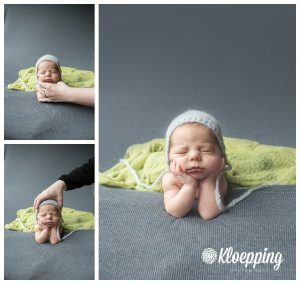 Even at that, not all newborns will do this pose. You can see, there are two (sometimes three) images needed to make this work. 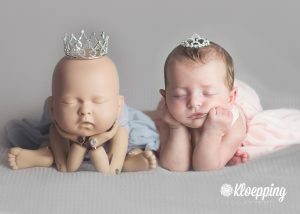 Once I get the babe up on their hands I have mom/dad or my assistant support the hands under their chin so the baby is never actually holding themselves up. I’ll step back and take a few shots of this at a few different angles. Then I’ll have whomever is assisting switch their grip. So, while still supporting the chin they use their other hand to support from the top of the head. Once they’ve got a good grip and the babe is supported, I’ll have them release their bottom hand. Now I have two images, a clear one of the top of the head and a clear one of the hands. Now comes the fun – Photoshop! I use the magic of Photoshop to lay the images on top of one another and erase out the hands of the assistant. It takes a little bit of time to get it all out smoothly but I’ve found that if I can get the assistant to vary their arm placement it’s easier. In Ashley’s case above her momma was in front of me so she couldn’t vary too much (we were in close quarters) so I took a third image of the bare beanbag and drop and added that to the image. I this last image she was pretty settled and comfortable propping her head on her hands. She even stayed pretty well on her own but it’s better safe than sorry. Just a little support on the top of the head to keep her from dropping to one side or the other. A quick trip to Photoshop to erase the finger (and the clamps on the far right..eek!) and we have a beautiful image of her on her belly. So you can see, it’s not just snapping a few pictures of your newborn. There is quite a bit involved, both during the session and in post processing. Your baby’s safety and comfort is of utmost importance to me so I take every precaution possible when working with them. I will never do a pose like these without an assist and many of my other poses are spotted too (babies in baskets that can tip have weights at in the bottom of the basket and they’re spotted by someone just off camera for example).